Our 8am Service is a great place and time to meet together and grow in the love and knowledge of God. 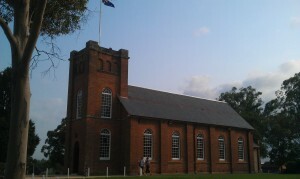 The Service meets in the Historic Church building near Mawson Park and is followed by morning tea on the lawn outside the Church Hall. The Service is often described as a traditional Prayer Book service; that means that we follow an order of service including readings from the Bible and prayers based on the Bible. The service includes sharing in bread and wine to remember the benefits of the death and resurrection of Jesus; this is known as the Lord’s Supper. All who love and follow the Lord Jesus are welcome to share in the Lord’s Supper. Individual cups and non alcoholic juice are provided as an alternative to wine and the common cup. The focal point of the 8am Service is listening to God’s Word, the Bible, read and taught. The service also includes singing songs of praise and reflection accompanied by a Pipe Organ; a statement of faith, prayers and occasionally interviews or testimonials. The current congregation is made up of between 80-100 people including many long term and new members. The service, although more formal than our others services, still has a warm and friendly feel about it. Once a person has settled into the 8am Service there are lots of opportunities to be encouraged, grow and serve. We would love you to come and check out this service whether you are inquiring about the Christian faith, a new Christian or a Christian of many years.